Running GO FAR races has become a tradition for the Arnold family. Because they were too young to join the GO FAR team five years ago, Ben and Eli Arnold needed a parent to join the club with them. Little did the family know then what an impact the club would have. Because mom Shannon taught at their school, Jamestown Elementary, it made sense for her to join GO FAR with the boys. Gary Arnold was content cheering on his family at GO FAR events with a cow bell for a while. In 2015, he and Shannon joined a program to learn about healthy eating, and in 2016, he decided to run a GO FAR race with his family. “I would get up every morning between 3 and 3:30 to go run because that was the time available, and it was also nice because no one was out at that point and no one could see me run, how bad it was,” he says. In the beginning it was rough. “When I started, I couldn’t run more than a minute, maybe two without feeling like I was going to die,” he says. It’s gotten a lot easier. This spring will be the ninth GO FAR race for the boys, eighth for Shannon, and seventh for Gary. 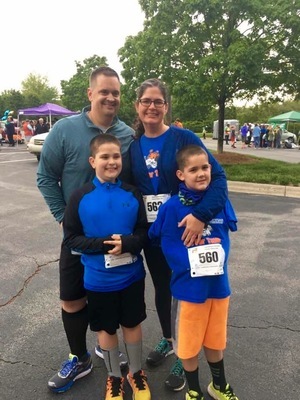 As a family, they run other 5Ks together, and Gary and Shannon also run 5Ks and 10Ks. Gary has now completed three half marathons and three ultramarathons and runs with a running group every week. Between running and eating better, Gary has now lost over 100 pounds. “Honestly, we are in the best shape we’ve ever been in, and we have two boys who wanted to run a GO FAR race but were too young to join the team by themselves to thank for it,” Shannon says. For Ben, a sixth grader, he’s found a sport he enjoys. It’s fun and challenging for him. He looks forward to GO FAR races with his family and hopes to volunteer at the events when he’s older. “The race is now a family tradition,” he says. Eli, a fourth grader, says he will be the most decorated runner at his school. The old record holder had seven medals, and he will have nine after the spring race. Shannon’s students enjoy GO FAR too. She sees a difference in her classroom and her students’ confidence. The spring GO FAR Family 5K & Fun Run is May 4. To register, visit https://runsignup.com/gofar.